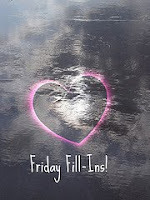 Thanks to Mama Jodi for reminding me about Friday Fill-Ins! What will your answers be? 1. I know I'm lucky to have such a well-behaved girl. 2. Months with 31 days are the longest month. 3. You can't help but smile back at cute kids. 4. I'm ready to rule; bring it on! 5. Where have you looked for work that you love? 6. Grocery shopping money is now available. 7. And as for the weekend, tonight I'm looking forward to seeing hubby before he leaves on another work trip next week, tomorrow my plans include chillin and bloggin and Sunday, I want to use my coupon for a free meal at Logans!